They say destruction is a form of creation, and it's hard to think of a form that would illustrate that adage more literally than found poetry. If you don't know it, found poets take other authors' writings, then remove or restructure the words and punctuation to make a new poem out of an existing work of prose. Often, that means slashing whole sentences and paragraphs. There are no hard and fast rules about how to do it, though the general idea is to use one or more pages of a book as a starting block and pare down from there. (Author Jonathan Safran Foer, of Everything Is Illuminated fame, prefers to literally cut out his found poems.) 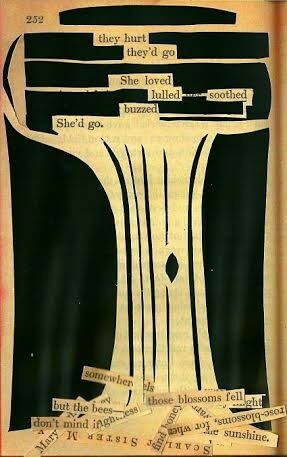 A favorite, oft-repeated phrase on found poetry websites and blogs characterizes the form as a "literary equivalent of collage." Found poetry has only really gained a following in recent years, says local playwright and educator James Moore, who is also co-founder of Steel Cut Theatre. Moore's book of found poems, I am the maker of all sweetened possum: poetry found in 'Scarlet Sister Mary,' was published last week by Los Angeles-based publisher Silver Birch Press. "It’s an evolving form and there’s a lot of room for experimentation and different ways of going about it," Moore says. "It’s not quite in its infancy. Maybe more like troubled adolescence." Moore, like many others, came across found poetry by word of mouth and by tapping into online writing communities. A fellow Vermont poet shared some examples. Moore remembers thinking the poems "looked like redacted government documents." But, always eager to experiment, Moore began playing around. He began paying attention to an organization called the Found Poetry Review, which publishes print volumes of found poetry collections. The group also has a blog, and organizes events for its online community. For National Poetry Month in 2013, FPR came up with a creative project: The Pulitzer Remix, in which 85 poets were each assigned one of the 85 (now 86) Pulitzer-winning novels. As Seven Days wrote at the time, Moore and fellow Burlington writer David Krivilsky were among the participants. Moore's just-published I am the maker of all sweetened possum is a collection of the poems he created from Julia Peterkin's 1928 novel Scarlet Sister Mary. Peterkin, a white author living on a plantation, depicts mostly black characters. The title character, Mary, is a strong-willed orphan that the novel follows into adulthood, when she's torn between being a good church member and embracing a life of sin. "The issues raised in this book were really exciting for me," says Moore, who at first attempted not to read the novel so he could focus on the language and the prose. But he soon changed his mind and read the whole thing through. "There were parts that felt so open and so amazing, that this white woman raised on the plantation [in the 1920s] wrote such three-dimensional characters," Moore says. "It’s a pretty good feminist text, about this woman who is really trying to find her own way ... Despite her community's attempts to contain her, she lives her life how she wants to. I don’t know it ends well … but it’s a very rich and entertaining story." 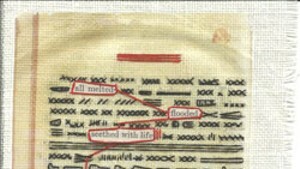 Moore's book is half text (with the words of the found poem printed in plain type) and half visual collage, with photographs of his inked-up pages of the antique copy of Scarlet Sister Mary he'd ordered online, his handwritten drafts, or image-based collages of the found poems. Though found poetry appears to be coming into its own in online forums and blogs, poets have been borrowing other people's words and working them into their own poems for a long time. Ezra Pound's "The Cantos," for example, uses speeches given by religious and political figures; T.S. Elliot famously lifted lines from Shakespeare. Today's found poetry might at first seem to be more the stuff of Tumblr and writing-group exercises, but a handful of small presses have started publishing paper copies of found poems — a first step toward literary legitimacy. Meanwhile, Moore says he's found the online community quite active and supportive. "When you’re using someone else’s text, it’s hard to feel a lot of ownership," he quips. Plus, Moore and Silver Birch Press first connected when the latter reblogged a found poem of Moore's that he'd made from a page of The Great Gatsby and posted online. Moore says there were challenges to creating poetry from unfamiliar material while attempting to stay true to the language of the original author, yet he finds the limited structure of the form actually gets his creative juices flowing. "The words and phrases in someone else’s works aren’t necessarily the ones you’d choose," he explains. "I learn from using someone else's words. It’s almost like I can tap into a grandiose sense of the world and bigger issues, which is not something I'd be comfortable with by myself. But using someone else’s words opens me up to that."